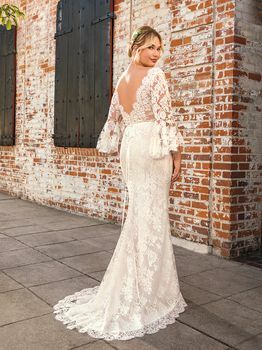 Peyton’s three-quarter length long bell sleeves make her an irresistible bohemian wedding dress beauty! 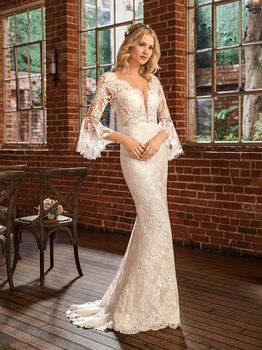 This stunning gown from Beloved by Casablanca Bridal is covered in Chantilly lace, subtle silver beading dotting the bodice and sleeves. Her plunging neckline is charmingly sensual, while an optional belt at the waistline emphasizes the bride’s natural shape. Stretch chiffon sits underneath for comfort and functionality.